Legal document entitles someone to handle financial matters on your behalf. This can include cashing checks, withdrawing money from an account, and selling and buying property in the principal’s name. 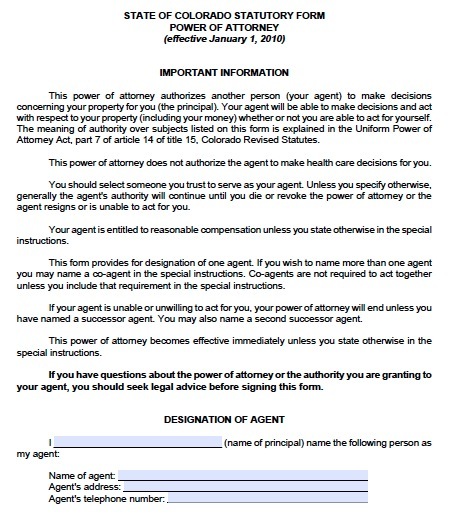 The form allows the principal to select a general power of attorney option, meaning that the agent may handle almost many financial matters on behalf of the principal, including general power over real estate, insurance and annuities, stocks and bonds, litigation, taxes, and others. The principal may also select any one of these or a combination of them to limit the agent’s authority. This can be quite convenient if you need someone to handle routine transactions like withdrawing cash because your business needs cash on hand. The Colorado form requires principals to affirmatively select other powers if they wish to grant them, such as terminating an inter vivos trust or disclaiming an interest in property, because these actions could significantly reduce the principal’s property. In Colorado, all powers of attorney are considered durable upon execution, meaning the agent retains authority to act on the principal’s behalf if the principal becomes incapable of making his or her own decisions. Notarization is highly recommended, but only required for real estate transactions in Colorado.